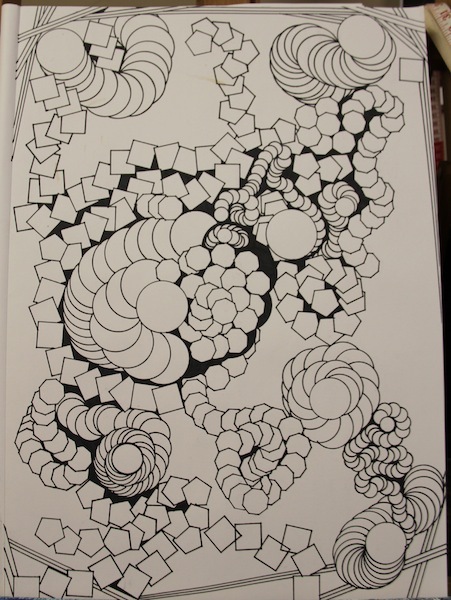 Below are images of line inspired ink drawings that I create or rather, they create themselves through me. If you are a follower of my blog, then you probably already know how much I love line. As I have said in the past, I fell in love with line when I was in Art School, back in Melbourne. 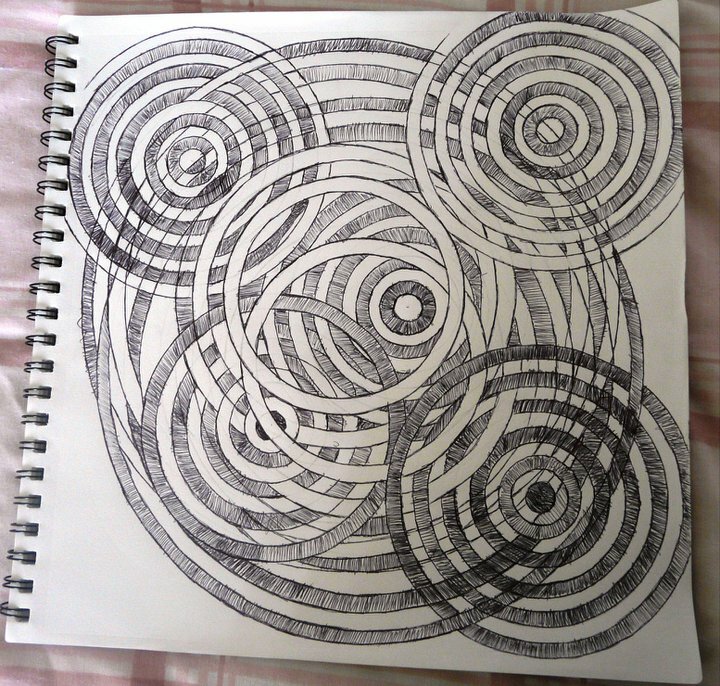 I thoroughly enjoy twisting into myself through this medium and creating simple, yet complex pieces of art. Some of these drawings took hours and some only a few minutes to create. 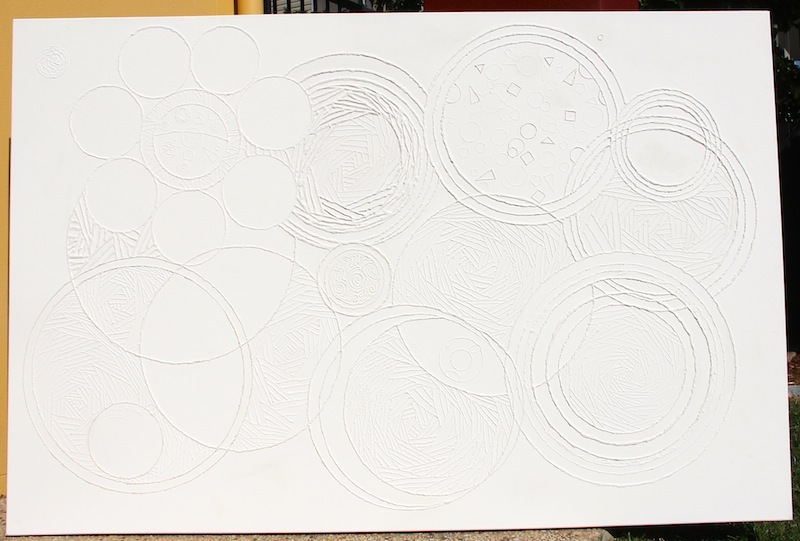 Circles are a feature in my artwork as they symbolise the never ending cycles of life, death and rebirth to me. Life has many phases and I have found that even when we hit an emotional wall or something breaks down in our lives, the symbolic death, always leads to a new rebirth and beginning. Life as we once knew it, will never be the same. 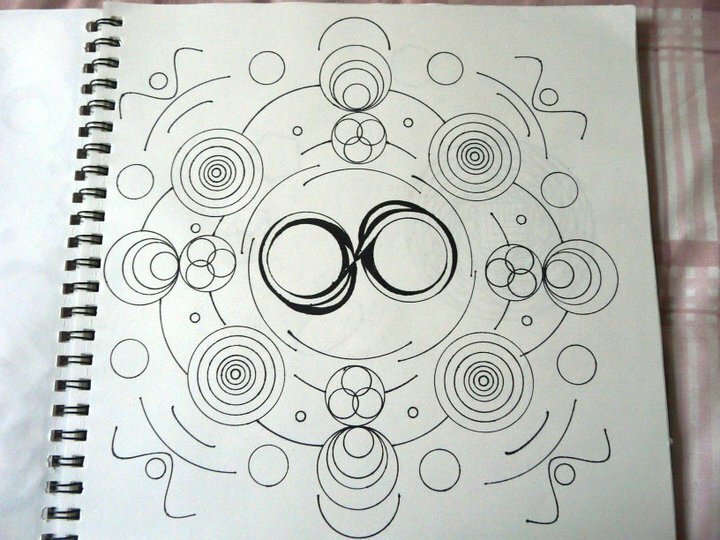 That is one of the reasons that I love circles so much and you will see them feature in my artwork over and over. 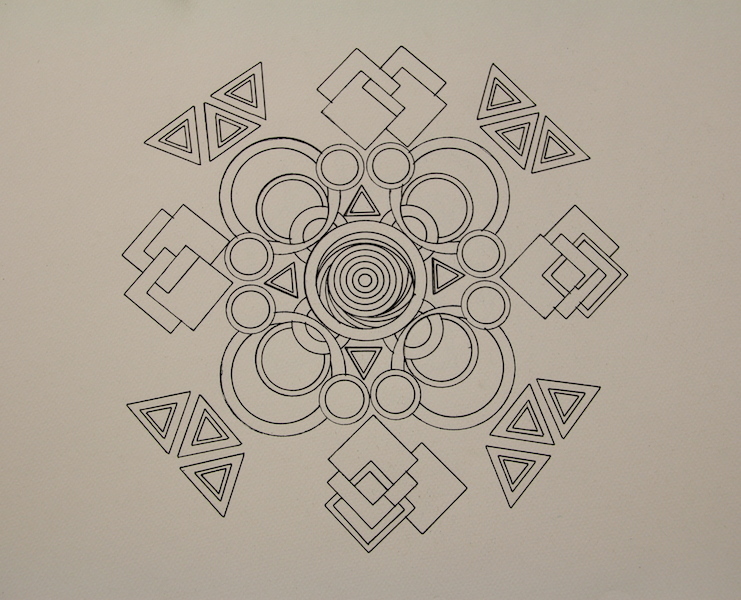 Intricate Mandala was created some time in 2013 and when I look at it, I am reminded of the Mayan civilisation. 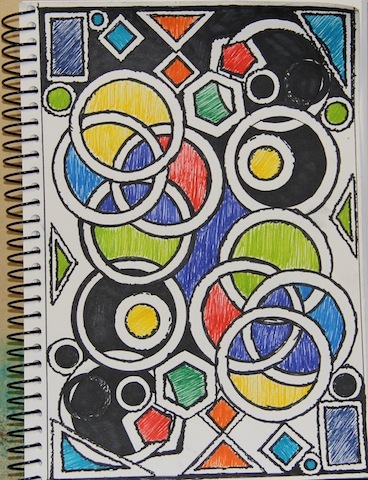 I think it may have something to do with the triangles and circles however, I am not sure exactly what gives me this inner feeling about this mandala. 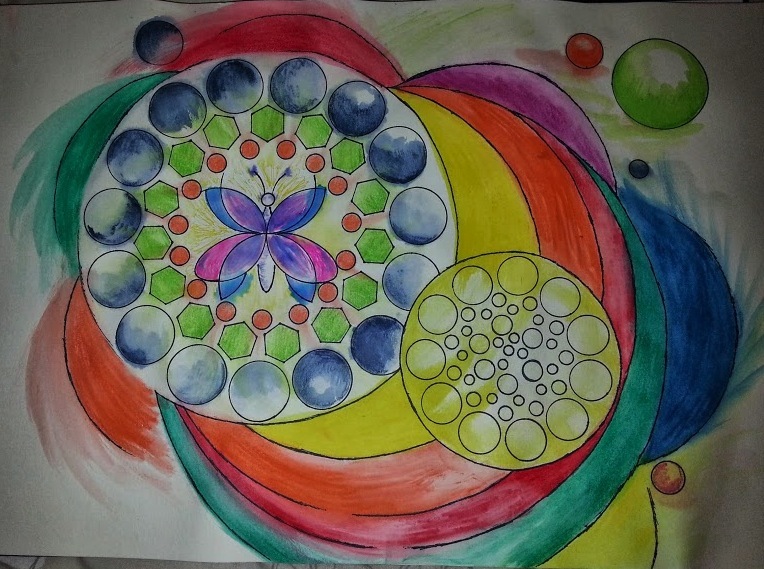 Another person may look at this mandala and see something quite different to me. That is another reason why I love art. People can come to the image and connect with it and their deepest selves through the internal experience they have with the image before them. That’s kind of cool! 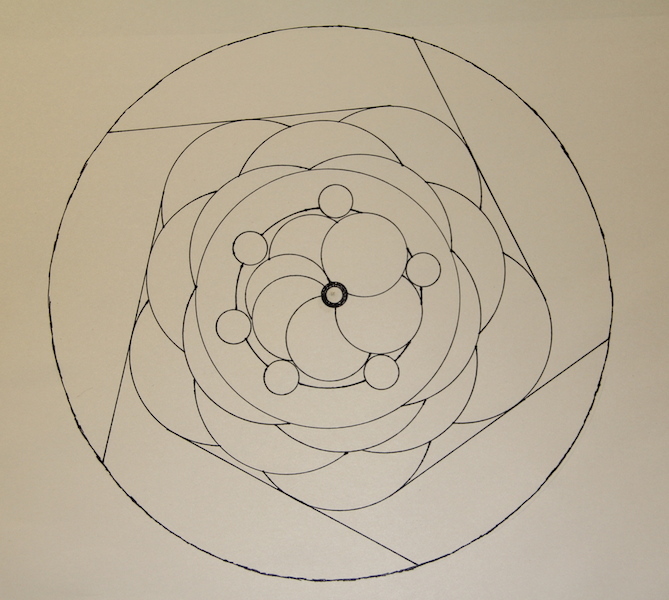 Simple Mandala was created from a circle in the centre. I put a mark on the paper and this is what grew from that one tiny action. Life is like that too. We make a decision (or put our mark on an experience) and what falls out of it is something quite profound when we take a moment to really reflect on it. The outpouring of a new set of experiences and consequences from that one moment in time. We make our mark through our actions, our thoughts, our mental state, our emotional state and how we choose to move from one situation or experience to another. Mandalas have so much to offer the conscious if you give them half a chance to let you get quiet and shine your inner wisdom onto the page. If you like my art and my thoughts about my art, I would really appreciate it if you would take a moment to comment and share it with those who you know would also enjoy my musings. 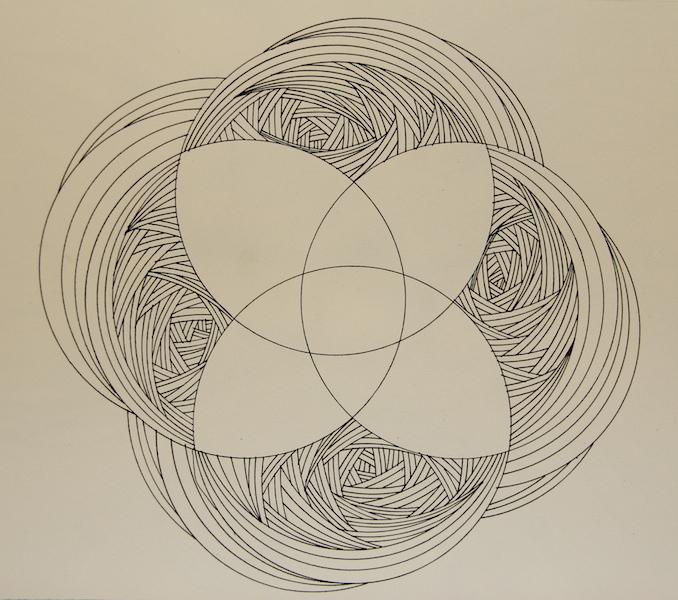 This blog is dedicated to my love of geometry and playing with line. These images are works in progress. Each piece takes hours to create but I love the process as I get thoroughly lost in what I am doing and things feel… just perfect for me as I explore my love of geometric art. 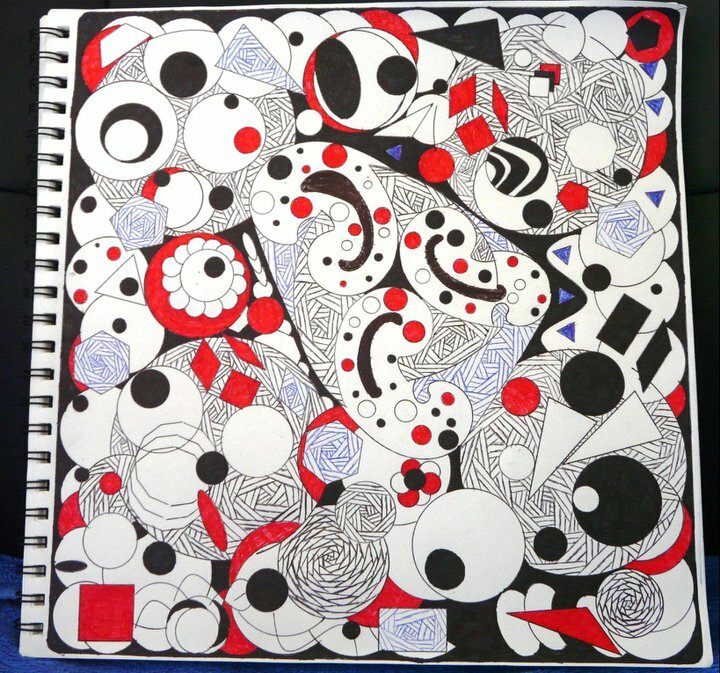 This is an A3 size drawing that I have been working on in November 2013. 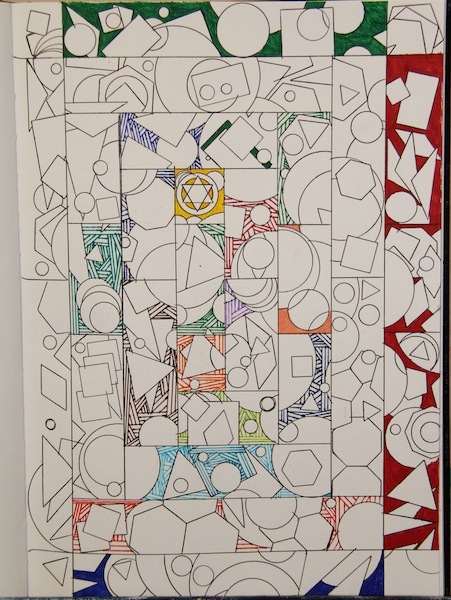 I love how the geometric shapes create a world unto themselves that the viewer’s eye can follow around the whole piece. This is a progress photo and I am sure it will create itself into something pretty cool as time goes by. This is a bit of visual diary play from last week. I haven’t finished it and will continue to work on this piece, mainly because it’s fun and that’s what art should be – FUN! This drawing in, yet another, visual diary, has been waiting for me to come back to it for over a year now. 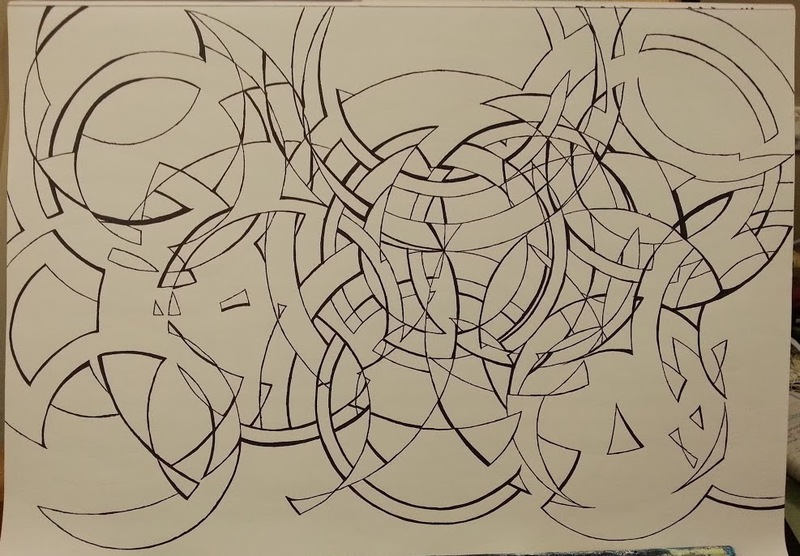 I cannot say exactly why I have not continued to work on this piece, except that I go through phases of intense artistic creative expression and then I am on to something else, such as reading or creative writing. 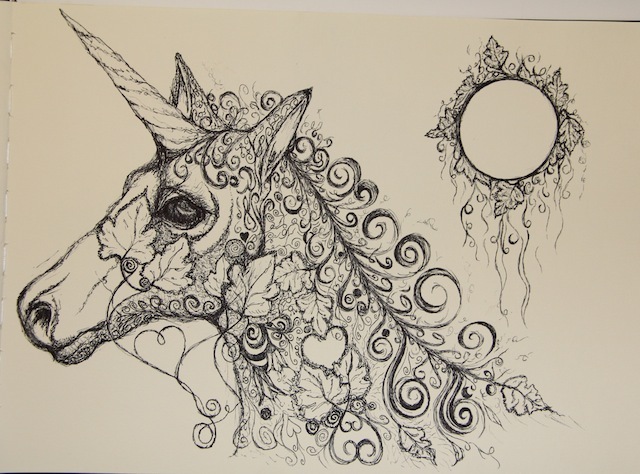 I must admit that, I do love the complexity of this type of art. My right brain must be in heaven when I am deeply involved in this type of creative expression as I do not notice the passage of time. In essence, creating art is like creating and participating in a living expression of moving, yet still meditation. It is deep and profound while I am in the flow of the work and my mind flits from one contemplative thought to another. I do love that about creating art. I was having a look through some of my recent and much older visual diaries tonight and felt inspired to share some of my works with you. A number of them are still works in progress and these are only progress shots. They are also an indication of the type of themes that interest me as an artist. This was created in my visual diary, 22/8/2004. When I was in art school back in 2004, I fell in love with Man Ray’s photographic works. I loved the multiple exposures and creative effects he brought to the world through his photography and I wanted to honour that inspiration in my visual diary. 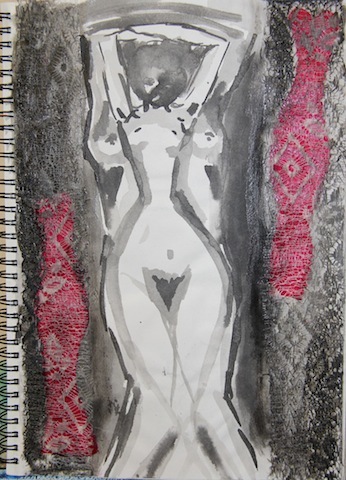 The image above was created with black indian ink, lace, ribbon and glue. This image shows some cropped painting ideas that I put together for an art assignment way back in February 2004. We were asked to take an image and hone in on a part of it and explore painting it. 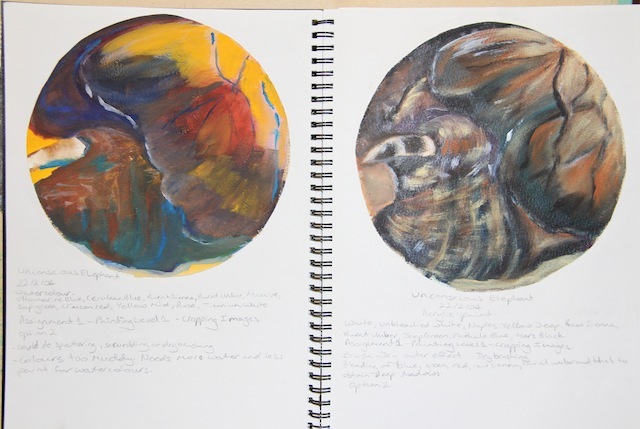 I created the two paintings in my visual diary as a test to figure out if I liked the image enough to go from watercolour, to acrylics and into oils. The truth is, I actually ended up choosing a very different image to crop for this assignment, however, I have always loved these two sketched up paintings. They feature an unconscious African Elephant from a National Geographic magazine that I was drawn to at the time. Inspiration for art can be found in all sorts of places. 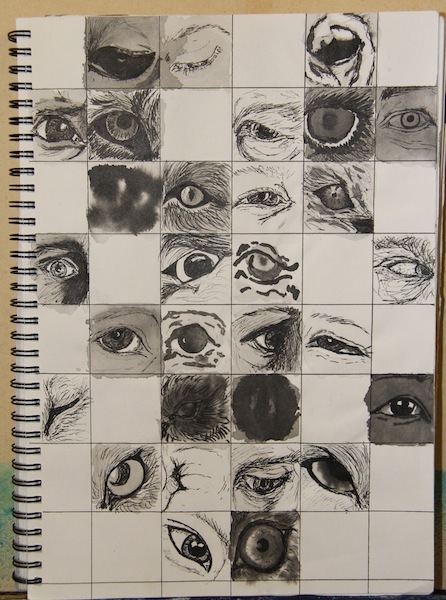 Eyes sketched in my visual diary as I formed ideas for further artworks. Mixed media exploration of culture and beliefs in my visual diary. This has to be one of my absolute favourite piece of art play from my 2004 visual diary. The reason I love it so much is that it explores the concepts of Heaven, Hell and Purgatory in life through images that I cut from magazines that came in the male. I have many notes written in my visual diary next to this mixed media art play as we were challenged by our art teacher to explore our concepts of the culture we lived in and the context it has in our lives. As I was cutting this out and gluing it into my visual diary, I was contemplating how people think and wondering things such as: does the level of your bank balance and physically acquired items determine your personal happiness? Or is there more to life than the physical items we surround ourselves with? I considered a concept that some people can find themselves feeling numb and unable to relate to life unless they are actively shopping and acquiring items… I considered the animals we take for granted and was particularly drawn to the cow hide in the original image. I thought a lot about the concepts… Do our earthly actions affect us in the afterlife? Is there really an afterlife? To me, I am open to that concept, but not all people are. Anyways, that’s my trip down my 2004 visual diary memory lane. More creative art is still yet to appear on this blog. 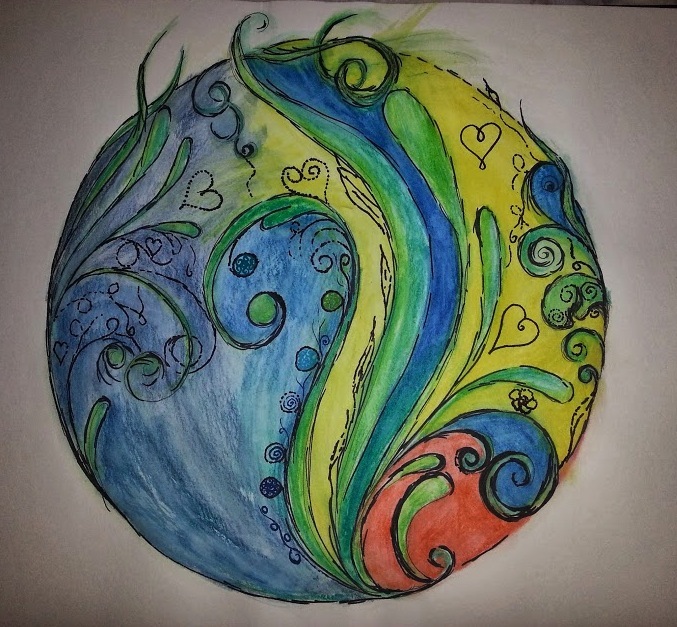 Thanks for taking the time to read my blog and feel free to share the arty creativity. The above two drawings were completed in the last couple of weeks. They are an intuitive expression of where I have been emotionally in that time. I have felt good about life and there has been more balance in my relationships. The butterfly is extremely symbolic for me and means a great deal to me. 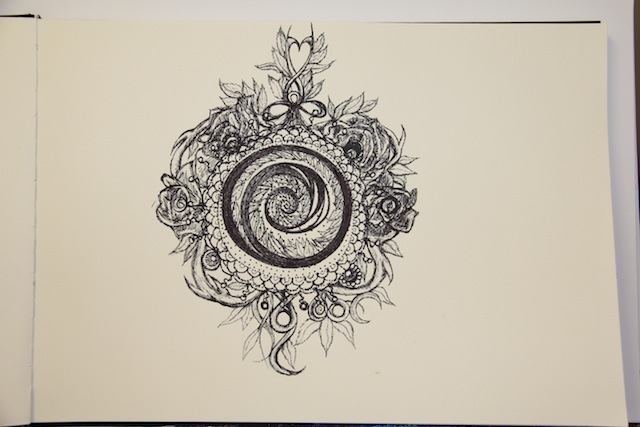 It symbolises opening up and becoming a new me, letting life and love into my world. I am excited to see where these types of drawings will take me. This is a painting that I have been working on for months now. This is a progress photo. I’ve used acrylics and impasto medium to get the texture and today, I have spent time mixing white oils with linseed oil to layer over it. The photo doesn’t really do it justice… I think that this painting will take a lot longer to complete as I am making it up as I go along. When I look at it though, I feel like it is a representation of the tapestry of life and the many interconnections we each have when we relate to other people, animals and nature. I feel peaceful when I am working on this painting and maybe that is because it is neutral. In a way, I feel it represents the divine force of life inside me, reflecting back to me the layers and depths that I have yet to discover. Fascinating stuff. I do love art! 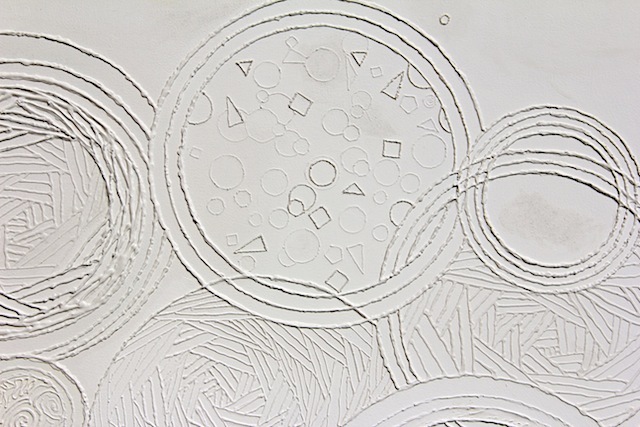 This is an up close image of the artwork before the oils have layered onto it as the first image is a bit hard to see.